ABS-CBN bagged a total of 26 trophies, including Best Station, at the just-concluded 25th Star Awards for Television of the Philippine Movie Press Club (PMPC). The awarding ceremonies was held last night, November 22, at the Newport Performing Arts Theater of the Resorts World Manila, Pasay City. ABS-CBN's rival station, GMA-7, won a total of 16 awards in different categories. 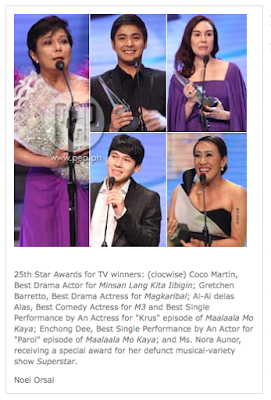 The rest of the awards were shared by TV5 with six; three awards went to Studio 23; and an award for a UNTV-37 show. and Atty. Persida Acosta, Best Public Service Program Host, for TV5's Public Atorni. Winners in the drama category include: actor Coco Martin, best Drama Actor, for ABS-CBN's Minsan Lang Kita Iibigin; Gretchen Barretto, Best Drama Actress, for ABS-CBN's teleserye Magkaribal; and Ai-Ai delas Alas, Best Single Performance by an Actress for MMK's "Krus." Ai-Ai scored a double victory; aside from her award for acting in a drama episode, she won as Best Comedy Actress for ABS-CBN's defunct sitcom, M3 (Malay Mo, Ma-develop). The Best Primetime Drama Series was also won by an ABS-CBN production, Minsan Lang Kita Iibigin. Aside from Coco Martin, who played a dual role in the drama series, none of the major cast were present to share the victory with its lead actor. This year, the top-rating and long-running Maalaala Mo Kaya (MMK) has been elevated to the Hall of Fame for having won a total of 15 awards in its respective category. ABS-CBN president and MMK host, Ms. Charo Santos-Concio, personally received the award. Without MMK in contention, the Best Drama Anthology award was won by TV5's Untold Stories From Face To Face, hosted by Amy Perez, which dramatizes stories culled from experiences of the mass-based Filipino. In the Public Service Program category, Bitag, currently aired weekly on TV5, was adjudged winner. Hosted by Ben Tulfo, the hard-hitting crime reportage was previously aired on UNTV 37. In the TV Documentary Programming, GMA-7's I-Witness remains uncontested; ditto its hosts Kara David, Jay Taruc, Howie Severino, and Sandra Aguinaldo. Another docu program from the network (GMA News TV), titled Pluma: Rizal, Ang Dakilang Manunulat—which focused on our national hero Dr. Jose Rizal's life and times and exceptional brilliance as writer-novelist—won as Best Documentary Special. Aside from the award won by Anthony Taberna, two other awards went to Studio 23's lifestyle show, US Girls: Best Lifestyle Show and Best Lifestyle Show Hosts. US Girls hosts Angel Aquino, Iya Villania, and Cheska Garcia-Kramer were all present to personally receive the awards they've won. From Net-25, two of its banner shows made it to the winners' circle: Moments, hosted by Glady's Reyes, as Best Celebrity Talk Show; and Spoon's Janice de Belen, as Best Celebrity Talk Show Host. Gladys attended the event with her actor-husband, Christopher Roxas Sommereux; while Janice was with manager, Poppoy Caritativo.